The Gartley Pattern offers early warning of potentially significant reversals in price trends. Like all Harmonic patterns, it is formed by a series of specific Fibonacci reversals of price moves. It is thought to be successful about 70% of the time -- much better than house odds. Combined with sound trade management technique, it can provide significant returns with limited risk. It's a rare week that I can't find a decent looking Gartley Pattern set up. On November 7, 2011, I saw one forming on SPX and posted about it here. With SPX at 1261, the Gartley indicated prices would rise to 1276.13 and reverse. 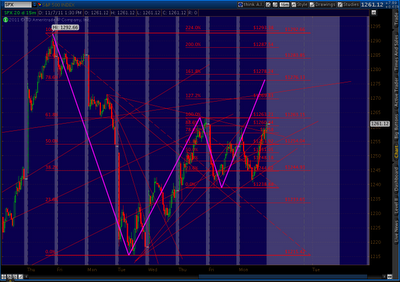 Here's the chart I posted that afternoon; the purple line shows the forecast move. 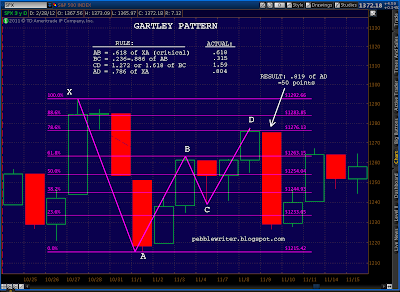 Let's take a look at how Gartley Patterns work, using the actual prices from October 27 - November 9, 2011. I'll use the daily chart from that period to illustrate. A Gartley begins with a significant directional move. The origin is labelled X, and the terminus is labelled A. The size and timing of the original move isn't crucial; I've played some Gartley's that spanned years and others that spanned an hour. The reversal at Point A establishes the low of the pattern and our first leg, known as XA. Next comes a move back towards the origin price -- aka a retracement. In a Gartley Pattern, a retracement always occurs at the Fibonacci 61.8% of the XA leg -- meaning simply that we have recovered 61.8% of the initial price drop. Note, Point B can be off a little, but a very big miss means it's probably going to be some other kind of pattern -- or none at all. Here, our Point B came in very, very close to the .618 level: 1263.21 versus the ideal 1263.15. At this point, we start to wonder if we have a potential Gartley on our hands. The ideal BC leg will typically range from 23.6 to 88.6% of the AB leg -- although this is the least critical measurement of the entire pattern. I've seen Gartley's successfully play out with tiny little BC legs, and others that retraced almost the entire AB leg. Here, we saw a 31.5% retracement. It's not a Fibonacci number but, again, it's just not that important as long as it looks like a significant reversal. The next phase of the pattern -- the CD leg -- is the most thrilling. We know, as we pass our previous Point B at the 61.8% level, that the 78.6% level waits up above. Knowing a reversal is coming, especially when everyone else is getting more and more bullish, is both scary and exciting. In this case, the ideal Point D was 1276.13. Again, this represents a 78.6% retracement of the initial price drop from X to A. We surpassed it just a little, hitting 1277.55. A little overrun isn't unusual, especially -- as happened here after a 16-point gain -- the market has a head of steam on it. The next phase is the fun part. After reaching Point D, a typical Harmonic Pattern reversal is 61.8% of the AD distance. In this case, that would have been a 39-point drop. Instead, we had a 81.9% drop the next day for a whopping 50-points (3.9%). At times, reversals can go beyond Point A for a 1.272, 1.618, etc. extension of the AD distance. In fact, over the following 11 sessions, SPX fell an additional 64 points for a nearly 200% extension -- a remarkable 5:1 return for those at-the-money puts. As mentioned earlier, Gartley's don't always work. So, it's prudent to plan your trades carefully. Many traders, for instance, will jump in just before a target is hit and place a stop just on the other side of their target. I have several rules that I typically follow to limit my risk when putting on such a trade. I also look for corroboration from other chart pattern and technical analysis. The Gartley is just one of several Harmonic patterns I watch for. Some, such as the Butterfly and the Crab, often result in much larger reversals. On the new website, I will discuss each -- using actual examples from the past few months. I will also identify patterns I see setting up on various securities/indices and in different time frames -- as well as the trades I'm using to capitalize on the patterns. Look for any updates during the day in the COMMENTS section below. Our model portfolio is up 2.27% so far for our first week. PW, Thanks very much for your information. You mentioned that you might charge a fee for the new web site. When we do the new web, could be consider a small fee instead. I assume many of your readers are typical investors who are not rich and who might not have benefitted from this "bull market". For one thing, frequent readers of your tend to non-believers of "strong recovery" in this economy and likewise would not have invest for "this strong market". On the other hand, they might have bet against it and lose some. Thanks, Tommy, I appreciate the input. I count myself as one of those who has not "benefited" from this melt-up to the extent I would have liked. But, we're over 1370/13,000 now, and I think having that question settled will allow us a little more leeway in terms of expectations. Based on the several hundred responses I got when I first floated the idea of a subscription website, I plan on offering tiered levels. Those who trade actively and want a lot of information quickly and frequently will have the option of paying more; while those who trade less actively and/or require less information will have a more modestly priced option. Also, rest assured that current followers of the site will be offered a preferred rate. My overarching goal is to ensure that whatever fee is charged is more than offset by an investor's incremental investment gains. Pebble, are we involved in a mega-mega-Gartley off the 2009 lows right now? Early 2010 gives us the .618 retrace, and we are very close now to the .786 @1381. 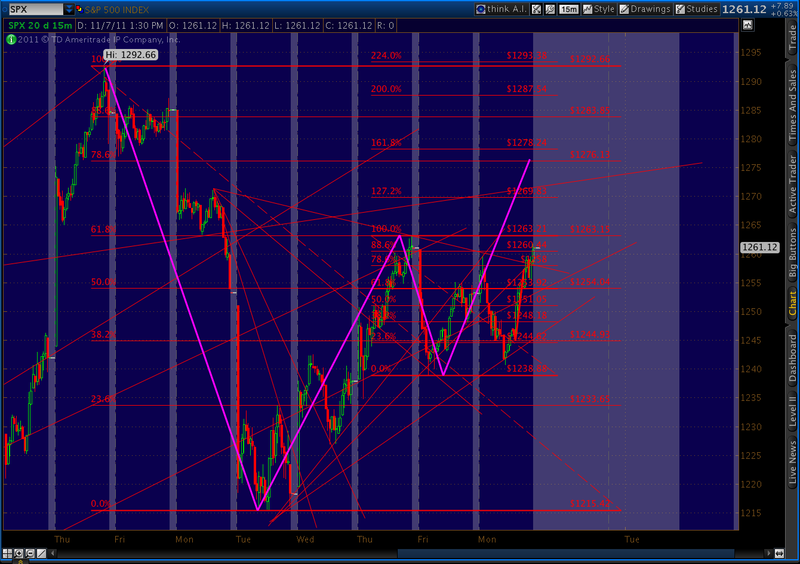 In my opinion, the previous 1370 turn last May was a result of the Gartley. I started writing about it at that time. http://pebblewriter.blogspot.com/2011/05/skating-on-thin-ice.html Like most people, I thought it just triggered a little early and that we were done with it when P2 was pronounced "done." We've completed a large Butterfly pattern at 1375.47. And we have reversed, captain. For those looking for a real-time potential gartley pattern playing out check out CL today on the 30-min. Use yesterday's high of 108.29 @ 1 PM (just before the selloff) as X and the low of 106.20 as A. Its working on the CD extension as I write. This is great stuff, PW. Thank you for sharing your time and your knowledge. Pebble - Love the site and have been reading daily for the last 4-5 months. When you are playing a gartley, whats your exit strategy after a successful reversal from D? In this example, were you just looking for the initial one day drop with that big red candle, or were you expecting the much bigger reversal that came over the next 11 sessions? To me, this is the most challenging aspect of investing -- knowing when to take profits. If you're a scalper/day trader, you'll be happy with a quick profit on the initial move. Swing traders will be more interested in longer term trends that have greater potential. Personally, I lean torwards the swing trading approach -- looking for at least a .618 retrace as discussed above. Although, there are many times when I take a position to capitalize on, say, a corrective wave that might not have all that much room to run. 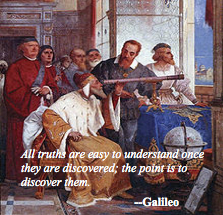 I always try to look beyond the pattern itself and see what other TA techniques and chart patterns indicate might be coming our way. GC just fell out of bed, currently down 70. I was looking to short around 1800, so hadn't put on any new shorts. I'll look for a bounce to backtest the RSI TL and probably initiate a small position. Gold's 60-min chart, showing the RSI TL break and a test of the previous lows. CL also seeing a sizable drop today. While we had a nice reversal off the .886 Fib (Bat Pattern), I think it's likely we're seeing a back test of the recently broken Fan Line from the 2008 highs -- seen here on the daily chart. The 60-min chart shows a bounce off a decent looking channel. PW, do you think VIX is still carving out the right shoulder of the inverse HS pattern? or that has been invalidated already? the drop in silver is even more eye popping from high of 37.5 to low of 34.06 in a matter of hours...Curious what do you think of silver? do you think it is in a wave 2 down now, with higher high to come? or you see it going lower lows? works for me. what cycle length are you looking at? I'm adding a 2.5% long position in USO -- the oil ETF -- to play a bounce I'm expecting. For our $100K model portfolio, it amounts to 62 shares. I'll watch the CL channel (see below) for any signs of a break down, with a stop at CL=103.70. My near term objective is 110, though if we exceed that we should retest 114.83. To reiterate, this is quite possibly a counter trend bounce -- though world events could easily turn it into a longer-term, core position. I'm initiating a new 5% position in TZA to play the NDX -- which is rolling over on the 60-min chart. This amounts to 265 shares at 18.96 in our $100,000 model portfolio. I'm watching a potential Butterfly pattern set up on XHB - the Homebuilders ETF. Right now, its reaching new highs on negative divergence and is deep into a rising wedge. A long-term TL on the daily chart was broken and is being back tested. From the looks of it, I think the back test will probably complete at around the 1.272 on the XHB daily price chart. I'll be looking for an opportunity to short this puppy as we approach 21. I don't really watch silver -- too volatile and unpredictable for me. But, it still looks to be in a declining triangle that began Apr 28, 2011 with 26 as the base. Watch for a break of the base or the TL (37ish), but the odds favor a return to the base. Good post, nice to see someone explain what this G' pattern is. All I need to know now is what those Crabs are all about? A pretty entertaining Wednesday, especially for the metals. Thanks, it got all the way to 37.5 then totally collapsed to 34 before getting back to just under 35. So if 26 doesn't hold, where would the next target be? Thank you very much. You are very generous. I would like to see something happen before July and that seems to fit with your charts. I was just reading about the CDS non-event. March 20th seems to tuck in nicely in those converging lines. So - for a lay-person with no real math or economics skills (but 30 years of programming exp. :-)) is there a primer 'bible' you can recommend ? You're welcome. There are a number of great books, from Getting Started in Chart Patterns by Tom Bulkowski (great primer) to Technical Analysis of Financial Markets by John Murphy (closest thing to a TA "bible.") I also use mostly technical analysis and chart pattern along with harmonics here, and try to make it educational. Good luck. Ok, if you will have me, I'd like to play along with your model portfolio (I've segregated some funds into a new PW account). I'm having a little trouble following the thread. What is the best way to follow along ? Will there be a better time to sync up with your holdings ? This is your playpen but rationale (entry/exit etc) would be appreciated.